looking out over the darshan area. Recent video of the Muddenahalli group enjoying holidays. Interesting footage. A follow up on the Muddenahalli Team – two years on. Curiouser and curiouser is the case study of Madhusudan Rao Naidu, the former student of Sathya Sai Baba and later colleague and friend to Mr. N. Murthy. Several years ago I wrote about the beginnings of the “Light-Body” phenomena, when it first became known to the public at large. I have never been able to quite understand how, at first, we were told stories that Mr. N. Murthy, through dreams, was able to communicate with Sai Baba and to carry on the mission of Sathya Sai in a way most extraordinaire and beyond our ken! The whole idea that Sai Baba would be interested in carrying on a worldly sojourn from the astral planes just did not make sense to me. However, Mr. N. Murthy, decided he was the chosen one to take the Sai Baba mission forward and he explained why in detail, through a Souljourns video talk posted on line. He spoke at length to Ted Henry about his amazing mission – for those of you interested, I have reposted it here. Later the former student, Madhusudan came on the scene and proclaimed he was actually the one and only person to hear and see the “Light-body.” (The astral Sai Baba) and proclaimed himself to be the medium or “instrument” for the deceased Avatar! This caused many devotees to gather round him and pay homage at his feet, or rather to the unseen Sai Baba who was readily available to Madhu – at least in his own mind! The chosen venue for the darshans being Muddenahalli, the fourth branch of the Sri Sathya Sai University way up in the Nandi Hills. I am not sure that Madhusudan can actually cope with so many former devotees of the living Sai Baba now gathering at his feet, or to grant copious blessings and give Godly advice together with the odd trinket or two that he can now manifest – just like magic! After the group’s Kodaikanal visit during May 2014, the show and Madhu, the impish raconteur, was up and going and in full swing. The senior group with Madhu, were off on travels to far flung places, while picking up handsome donations from some of the richest followers of the original Sai Baba. I have to think how must life be for this youngish man upon whom, everything depends? He is responsible for a host of grief-stricken Sai Baba “hangers on” and is also responsible for the building/s of a new Sai Ashram in Muddenahalli as well as grandiose building projects for the future – among them, no less, a casino and a hospital in Miss. USA! Can he still be sane with so much depending on his dubious connection to the “unseen and unheard deceased Sai Baba?” Or has he, in his own mind, morphed into a self-styled God man while using the original Sai Baba name also mimicking his mannerisms? I cannot say. I only know that Madhu is carrying the world on his shoulders and I wonder if he can stay the course without some mishap or two. Probably by now, he has convinced himself that he is indeed a very special personage, the chosen one to carry on Sai Baba’s mission here on earth. I am beginning to feel “sad” for Madhusudan, the “Sukshema Baba” who has so much depending on his continuing performances to convince people that he is indeed in deep communication with Sai Baba, who has afterall, now been gone five years. Notwithstanding that the Sai world at large is scrutinising his every move and just waiting to jump on his case, when the vibuthi runs low and the luck turns thin. Just recently Madhu and his group visited Nigeria as guests of a wealthy follower of their cult. By all accounts posted on the internet, they were detained and questioned by the police about their activities and were then promptly deported. I am not sure they actually were deported, although that is the story one reads from the Sai Org. letter posted on line and the newspaper article that appeared shortly after. ( Both can be found on line.) I am not going into the full details of the offical letter or the constant flow of claims and counter-claims on both sides of the Sai movement, whether this is true or not. I would rather not be part of that. I actually don’t want to be part of anything or any movement other than be by myself nowadays. 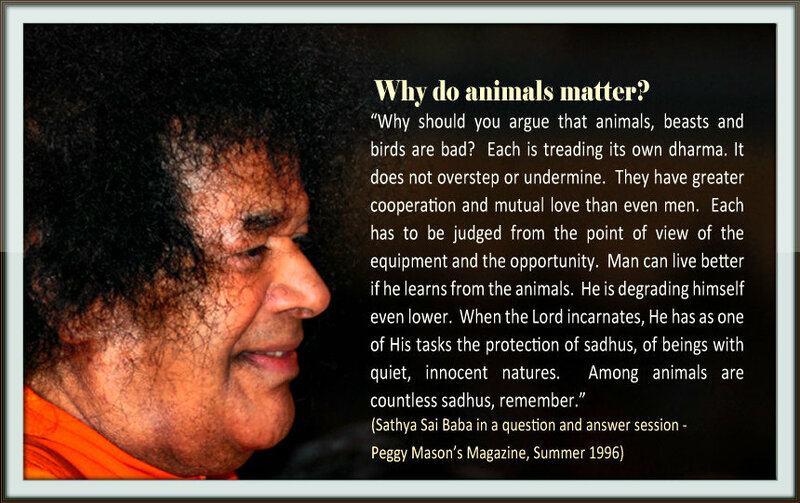 Still, I do have to wonder how long Sadu Madhu will be able to stand the pressure of being a self-styled Godman – to be the provider of solace, substance and miraculous boons to all who need a surrogate guru for the now dead Sathya Sai Baba. The Rudolf Steiner link I meant to provide is very hard to understand and long to read. I have instead, re-written the one paragraph that stands out. The astral being or the soul of the deceased – on reaching the higher realms does not interfere or mingle with souls on Earth, unless in the case of possession or are earth bound. There are cases where a medium might contact a spirit, often one not on the highest levels, to give messages to their relations of survival of death. However, these links are not ever strong and can only be sustained for a very short time. The energy of the medium or instrument and that of the astral soul, would not vibrate for long on the same frequency. That is just not possible. There are laws that govern the universe and for those who are complicit to using them for occult reasons, they are unable to do so at will. The boundaries between the Earthly realm and other higher realms are overseen by the universal laws. (The angels of Light.) Thus, the many types of energies, (the earthly souls and the astral souls,) cannot co-exist for long, due to the energy and vibrations of those on the light realms being very different from ours on Earth. thank you. Sathya Sai Baba with Dear Sai Geeta – now passed on. All is well here. Sai Baba is everywhere and his hand hand can be seen here in everyone’s lives. From dawn to dusk people talk of amazing first person experiences, from dawn to dusk my head spins from what I hear, see, learn and understand. Enough said. Somewhere from deep within the Deccan Plateau comes an evening breeze that regularly cools off the still tiny town of Puttaparthi. Following the evening bhajans and darshan, the walkway back to Round House 1 is a good place to catch the breeze that always seems to bring the day’s best relief from the hot winter sun. Yes, it is winter here, but who would know? Daily the temp climbs to the high 80s with seldom a cloud in sight. I do tend to go on about the ambiance of Sai Baba’s beautiful ashram. Actually I can’t help it. The late day’s devotional singing in the open air prayer hall clearly sets the stage for the brief program that remains at the end of each day here, a good dinner and a long read of one of the hundreds of Baba books available in the ashram. Jody is the chief reader in our apartment, but I manage to get in some good reading as well. And to my credit, as of heading into our sixth week here, I have yet to read a single word in any of the novels I brought to India with me. The evenings are anything but lively here. You’ve got the sound of the crickets outside, the occasional howling dog off in the distant, and the ever present whirring of the two ceiling fans in our flat. We spent time with Jay Jethna yesterday. Jay is from Austrailia and works for the United Nations. On video he told us three amazing stories, not the least of which occurred back in 1968. Jay was 13 at the time living in Uganda, where he was born. A friend told him that he had heard that God was coming to town in two days. Jay couldn’t wait and was extremely excited even though he had no idea if “The Blessed One” had a name or what he looked like. Jay and his family showed up to wait for Baba at the 6 pm appointed hour. It wasn’t until 1 o’clock in the morning that the country’s important guest finally arrived. Several people got out of the car but there was no sign of Him. When Jay asked someone about this he was told that the man in the orange clothes with fuzzy hair was who everyone was waiting for and that his name was Sai Baba. Jay had seen this man get out of the car earlier but thought he was one of the security guards. The next day Jay sneaked into the backyard of the people hosting Sai Baba trying to get another view of the important visitor. Baba was blessing people in the yard when he spotted Jay in the back. When he went up to Jay, Baba told Jay that he was not well, which was true since Jay had suffered from a serious life long asthma condition. And then Baba said, “Go”, but Jay thought this meant Baba wanted him to leave, to go back to school. But Baba wanted to see Jay for an interview, of course and later, once inside the host’s home Baba produced a fluid from the palm of his hand and applied it to Jay and said, “Go, no more sickness”. Jay left and from that day forward he has never suffered from asthma again in his life. Twenty two years passed before Jay gave much thought to Baba again. At the age of 33, he was visiting a shopping mall with his wife in Hong Kong. 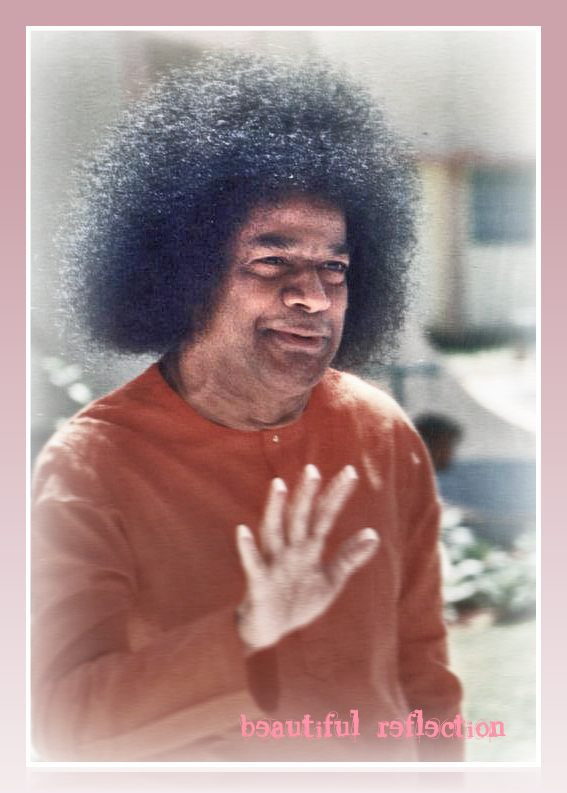 On the sign board were the words, “Sai Baba and this made him think.” This prompted Jay and his wife to visit the tenth floor offices of the local Sai Baba center. As they entered, bhajans were underway, something Jay and his wife, Julie had never been exposed to, but they stayed anyway and thoroughly enjoyed the experience. 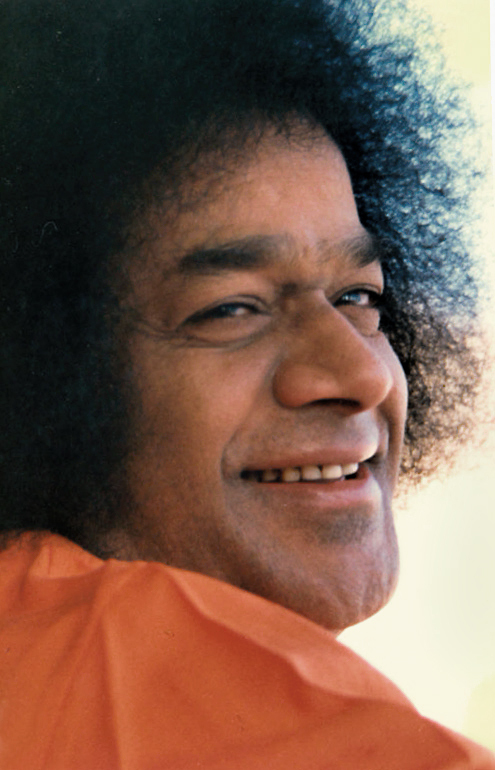 Needless to say, Jay reconnected with Sai Baba in his life and has become an ardent devotee coming to Prasanthi countless times since turning 33. Jay has two additional stories to share on Souljourns, both of which are blockbusters. Look for them soon at vimeo.com/souljourns and/or youtube.com/souljourns. Also look for the many other Souljourns interviews we’re recording in India. So far we have about 30 of them recorded, and in their own way they’re all powerful. Many of them include useful guidance for additional spiritual growth. Ganesha’s birthday was the previous day and I had just loved the entire event. The crowd was huge and we sat for a very long time in the mandir courtyard through all the ceremonies of Swami breaking the coconut in front of Ganesha’s new statue, placed on a pedestal inside the central arch of the mandir. Parade after parade of students passed in front of Swami as He sat in his swivel chair on the ladies’ side by the verandah. Each group proudly displayed its float of Ganesha. There was nearly an hour and a half of the most beautiful bhajans ( many of them Ganesha, I think ) with each voice sweeter than the last. The sound system was fantastic and so were the musicians. The tablas (small drums ) were fabulous and all the lead singers had beautiful voices. By the end of the day, I was feeling a tremendous satisfaction and a deep peace settled over me. I was so carried away, I even faxed a girlfriend in California about the wonderfulness of the day’s events so that they would remember Ganesha’s birthday at our Marin County Friday night bhajans. Upon awakening on Saturday, I was still feeling the sense of peace and satisfaction. When leaving my room for morning Darshan, I looked at my two U.S.A. group scarves, one red and the other white with U.S.A. embroidered on it and the other one, white with blue and red U.S.A. embroidered on it. I just couldn’t get interested in wearing a scarf. I figured there would be huge crowds still and no interviews. Usually I took both scarves with me, but this day I deliberately left the white scarf behind and wore only the red scarf because it could be seen so easily through the crowds and none of us had as yet found each other to regroup. I was even late for Darshan because I just had no energy. I got in the late line and ended up by sitting on the side of the mandir sort of near Swami’s old room, where the chair ladies sit. I realized I wouldn’t get very near him, but I observed that I was very close to the place outside his old bedroom window where I had prayed and prayed and wept to Him in the dark morning hours in August of 1990 and I felt very contented to be in this sacred spot. Suddenly I was aware of some men way in front of me and off to the left, wearing green scarves from Spain. They were getting up and I was absolutely electrified. I sat bolt upright and the word INTERVIEW exploded in my mind. My head snapped around to the left and I saw Lila and Nalini standing up talking to a Seva Dal. Oh, Vip’s I thought. Then I saw Glenn standing behind them and they were beginning to walk toward me and the verandah and I knew it was us. I grabbed my things and got up and started climbing over people, stepping in their laps, tripping on their feet. People were saying Sit down and I just kept saying over and over,’My group, my group’. There was no aisle near me and about 20 rows of women in front of me, but I managed to arrive at the aisle just as Nalini, Lila and Glenn were passing and so walked with them to the verandah. Then the Seva Dal said White scarves only. I was stunned. I had left my white scarf in my room! The Seva Dal hissed at me Hide your red scarf. I turned my head over my left shoulder while frantically trying to tuck it into my punjabi and saw about forty women with red scarves being turned back by the Seva Dal! Lila sat cross-legged next to the building, to her left sat Nalini, and Glenn sat on the outside. I crouched down behind Nalini and Lila and tried to shrink into myself and look invisible so I wouldn’t be noticed and turned back. A couple of other women sat down behind me. I whispered urgently to Nalini and Lila to put on their red scarves too, and Nalini spoke quickly over her shoulder Don’t say anything more! I shut up. Swami came over to us and looked down at Glenn wearing both scarves, ‘You wear two scarves, not good. If the white group is called you come, and if the red scarves are called you also come. That is cheating! You speak with forked tongue.’ His glance passed over Nalini who was wearing a white scarf and rested on Lila who had no scarf on. ‘Where is your scarf?’ He asked. In my bag, Swami, she replied. ‘Put it on’, He said. He gave me a dark look and turned toward the men. He reached out to Michael, wearing a white scarf, and gestured for him to go back and then patted Michael on the head and shoulder. Another young man wearing a red scarf was there, too, but Swami just indicated he should go into the room. We arose and went in. I was the last of our group inside the door. Swami stood inside the door as each of us passed by Him. I was still terrified He would turn me back. We sat on the floor near His chair and He closed the door and immediately waved His hand in a circle making vibhuti. I was closest to Him and put my hand out and was the first to receive vibhuti. In my head, I thought this was a good sign and maybe I wouldn’t be sent away. Swami went to sit on His chair and then leaned forward and made three jerks with His hand and a beautiful gold chain link bracelet appeared. He indicated to a man in the back to come forward. The man leaned forward ( somewhat supported by the other Spaniards) and, urged on by Swami, put his hand across Swami’s knees and Swami started to put the bracelet on. Then He stopped and held the bracelet up in both hands and gave two little jerks to it to make it bigger than before. Looking satisfied, He placed it around the man’s wrist. Next, He asked another man, ‘Where is your wife?’ I’m single, the man replied. ‘You have friend’, Swami said. The man tentatively replied ‘Yes’. ‘Good friend’, Swami said. Sort of embarrassed, the man said ‘yes’ again. ‘Get married’, Swami said. ‘Marriage is good. Friend not good. Get married.’ Then Swami made three swift jerks with His right hand and materialised a gold ring almost like a wedding band for the man who leaned forward and Swami placed it on his hand and said ‘Perfect fit’. Swami motioned for those men to go into the small interview room and looking back as He followed them in, He said to Lila, ‘Where is bender?’ She said, ‘What?’ He repeated ‘Where is bender?’ She continued to look puzzled ( I was too ) and then He said louder ‘Husband. Where is husband?’ Lila said something like ‘He is gone’ and Swami came back with something like ‘He left’ to which Lila replied, ‘No, I left him!’ Swami and the rest of us laughed and He disappeared behind the curtain of the small room. Lila then remarked that it was hot and asked one of the men to turn on the overhead fan. He did, but another man thought the rotors were making too much noise and told the man to turn it off, which he did. The people from the private interview room came back into the room followed by Swami who sat down in His chair. He then looked up at the ceiling at the fan, got up from His chair and slowly made His way through the men to the wall and personally turned the ceiling fan on and then returned to His chair. ( I thought this was very sweet. He could have asked someone to do it for Him. ) Then it was our turn to go into the private room. This time Lila was sitting next to the arm of the chair with Nalini and Glenn to her left and me behind them between Lila and Nalini. 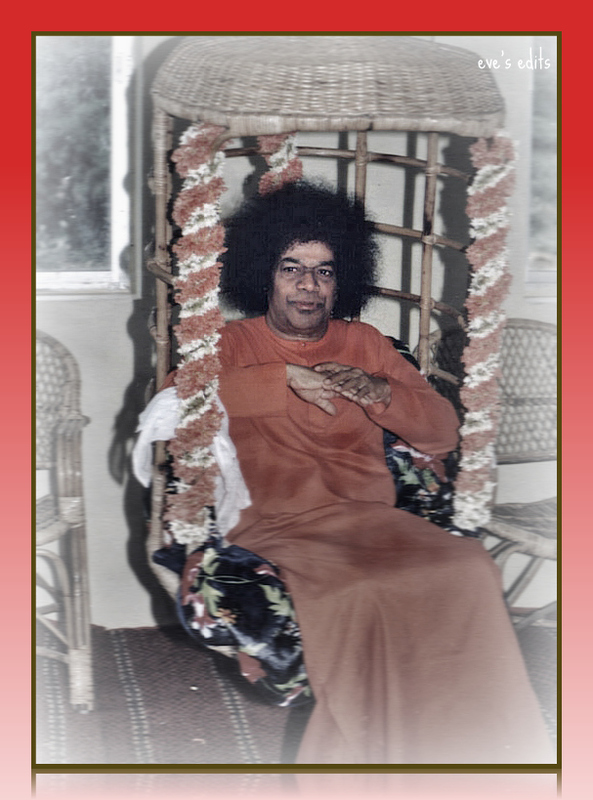 During most of this time, Lila held hands with Swami rubbing her thumb up and down His thumb. Occasionally, He would disengage to make gestures and then He would reach back for her hand. Nalini mostly kept her hands on His feet after first kissing them. At some point I squeezed in between them and Nalini lifted her hands off His feet and I put my hands on both His feet. It would have been too awkward from where I was sitting to try to kiss them or put my forehead on them. First, Swami spoke to Lila Youngs about her family and told her He would get her a good job. Next, He spoke to Nalini about her family and also told her He would get her a good job. Then He turned to Glenn and talked to her. Lila spoke up once more and asked Him something about how she could always know He was near her and He replied, ‘I am in you, around you, beside you. I am omnipresent.’ Then He stood up abruptly and patted Lila on the head and said, ‘You are mine’ and then turned to me and said ‘You are mine’ and Nalini, ‘You are mine.’ Glen quickly asked, ‘Swami, am I yours, too?’ He replied dragging out the word ‘Yeeese,’ and we got up and went to join the others. He kept the man with the red scarf inside for a few minutes more alone. When Swami returned to us, He handed out small packets of vibhuti to everyone. Nalini asked for more packets for her Sai Centre, and He gave her more, and said something about keeping some for herself. I also wanted more, but I could not quite manage to ask, the words would not come. Perhaps they did, but Swami ignored them. Anyway, I’ve read where He has said that He can heal the mind and when the mind is healed, everything else ( the body ) is also healed. Now I am rather thrilled at the idea He will heal my mind. He has said that healing occurs when there is reciprocity of devotion from the devotee. This I must learn to do. I have enjoyed many interviews with Sai Baba and Lila and Nalini even more. Now we must all learn to appreciate our good fortune and put more trust in ‘the innerview.’ I know many of you have not enjoyed the interview experience, but perhaps for you, there is no need. 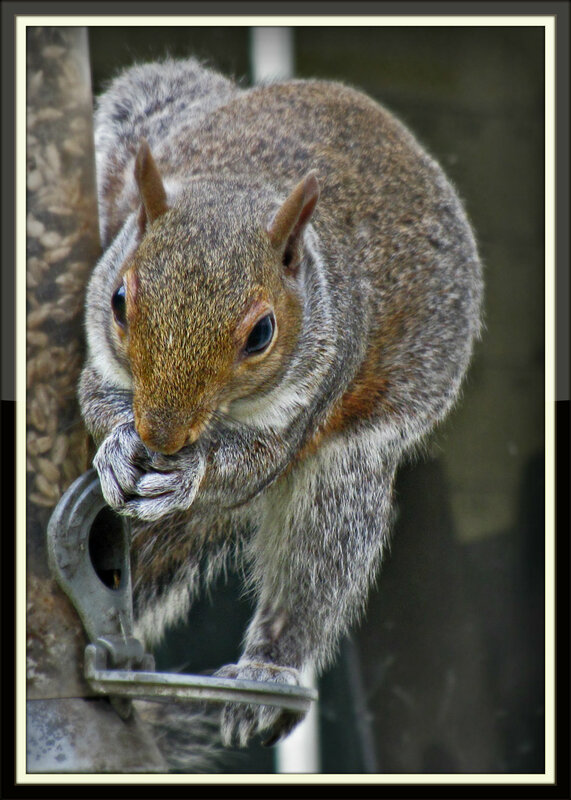 Many times during my life I have been alone and down, and am now a recovering alcoholic. I am beginning to appreciate life again. But it has been a hard uphill battle. 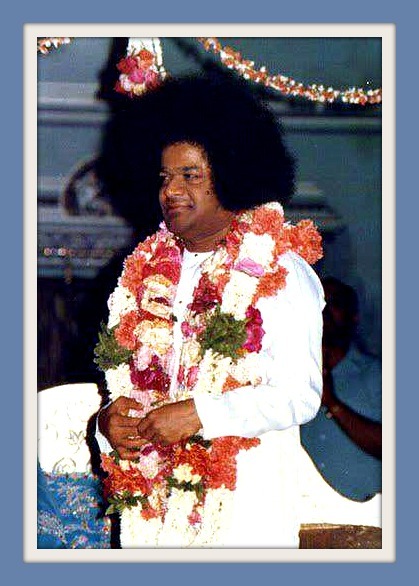 Lastly, I had given Swami a letter the week before at Brindavan. I had asked Him to heal my arms, but to do it however He felt best. He could do it instantaneously or use slower methods such as physical therapy or desk and chair adjustments or new types of keyboards, and so on. So, I feel all my prayers are now answered. Everything I asked for in that letter I have now received. For me, He has fulfilled my wishes. While it was Saturday, September 10, 1994 in India, it was Friday, September 9, 1994, Ganesha’s birthday, in the U.S.A. My Sai Centre meets on Friday nights, so while I was in the interview room with Swami, my centre was singing bhajans and celebrating Ganesha’s birthday. Therefore, by U.S.A. time in my own Centre, I had an interview on Ganesha’s birthday! What a present for me, Ganesha represents the removal of obstacles. Here is a short note from Venkata Muralidhar Chivukula who tells us that Swami gave us many hints of his imminent departure from this world. 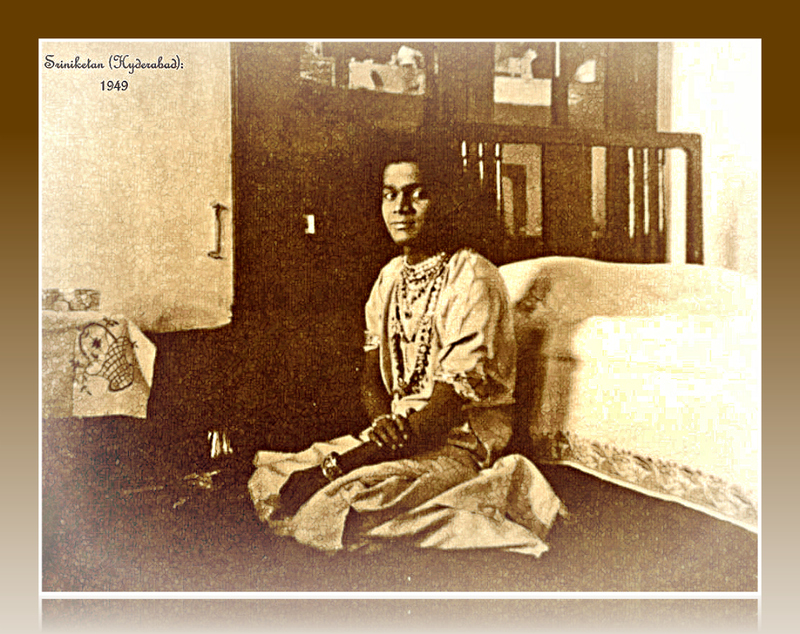 It became quite obvious to many of us that the chances of Swami living on until 96 years, simply was not possible. 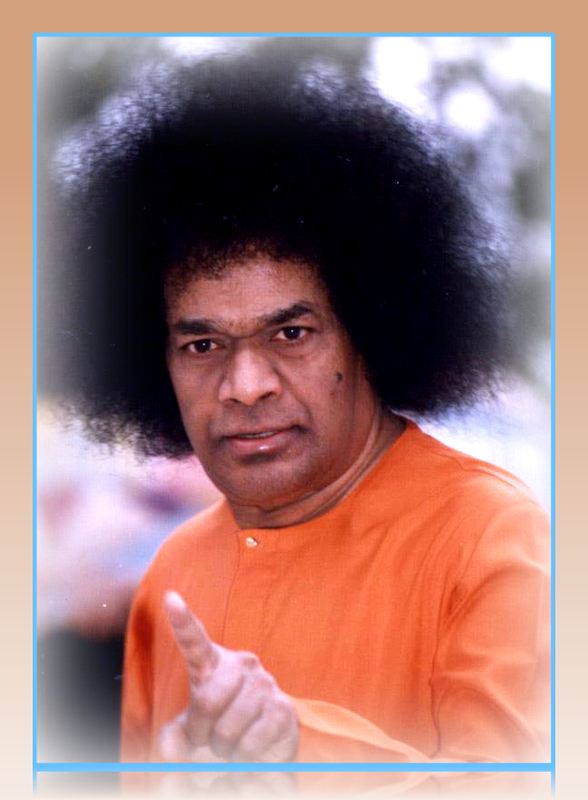 He suffered from, what I was told, two strokes, then from 2009 onward his health deteriorated rapidly… Sairam to all. 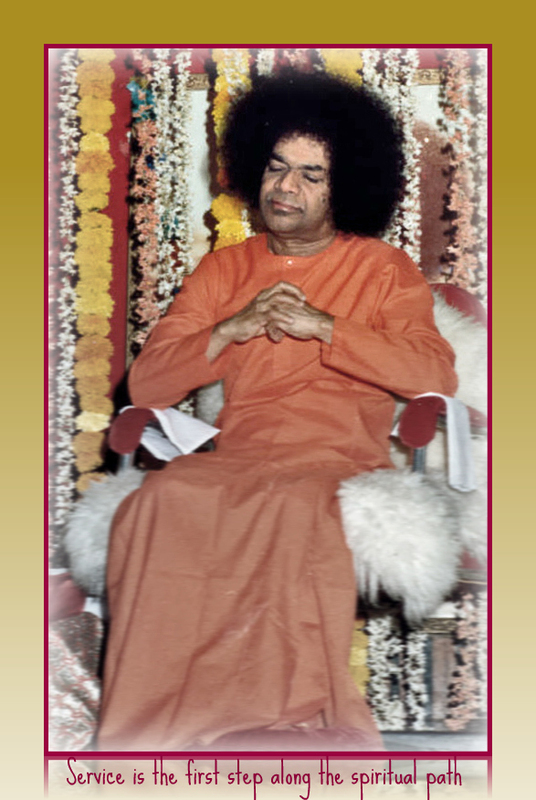 Swami gave clear indications to many devotees either directly or through dreams that He was leaving this body and assuming the COSMIC form like all Avatars have done. However many of us chose to deliberately block this knowledge from our minds or could not understand what He actually meant till after the event. No Avatar leaves till the spiritual tasks they have undertaken are completed. 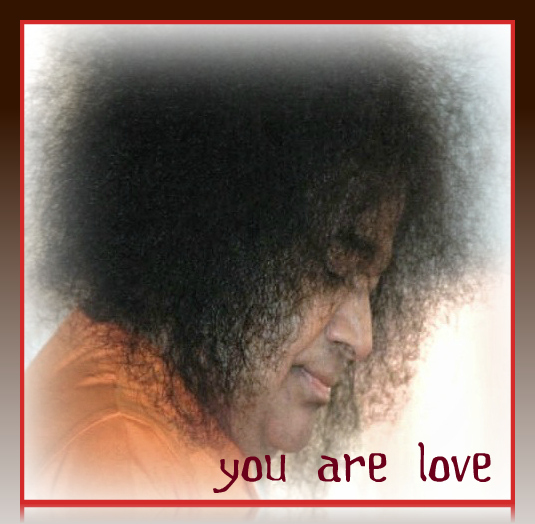 Swami had often indicated that raising the consciousness of humanity is what He has come for. The work was started by Shirdi Sai and will be completed by Prema Sai. 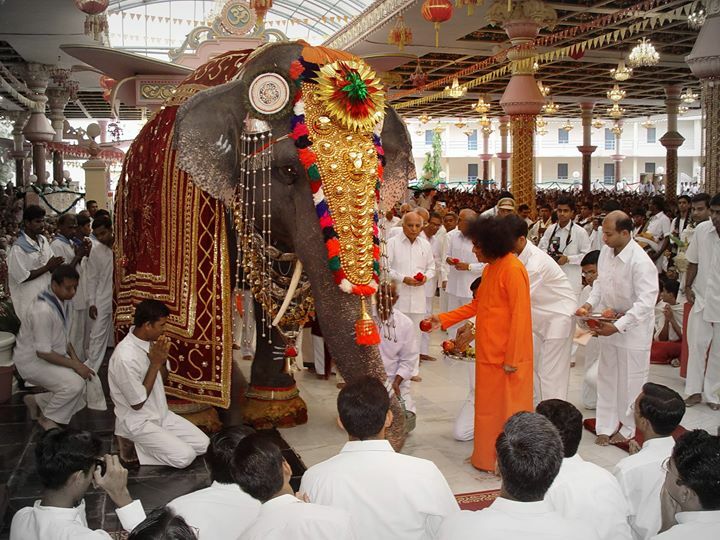 Our own Sathya Sai stands in the middle. Our exposure to Swami in different ways surely has transformed us; perhaps we lack the self-confidence to assert it because we are so used to having Him around and we are numbed by our grief. However nurturing the seeds of Consciousness that He sowed within us and watered them into saplings with His Love, is our foremost duty now Swami is not absent, in fact He is now PRESENCE, OMNIPRESENCE. We do miss his physical presence, but His Omnipresence has become more real in many ways. Grief can block this awareness and stop us from experiencing Him.He is also somehow more PRESENT within each one of us now, otherwise how is it that we have all not gone mad ? The body that He assumed suffered in many ways due to taking on the mass karma of humanity. Do you really want Him to come back in the same body and suffer again for our sakes because we do not choose to truly follow Him? For, that is what all Avatars do. They endlessly sacrifice and humanity carelessly laps it all up. Wanting Him to come back in the same body is selfish in one sense. When we truly love, we do not want the Beloved to suffer. So let us reflect on this. Were He to ‘come back’ now we will resume what we were mostly doing – disregard Him again. Let us not postpone our spiritual homework just because we have got so used to Swami doing all our assignments for us and giving us Grace marks. His mission continues and HE will not ‘come back’ because He has not gone anywhere. 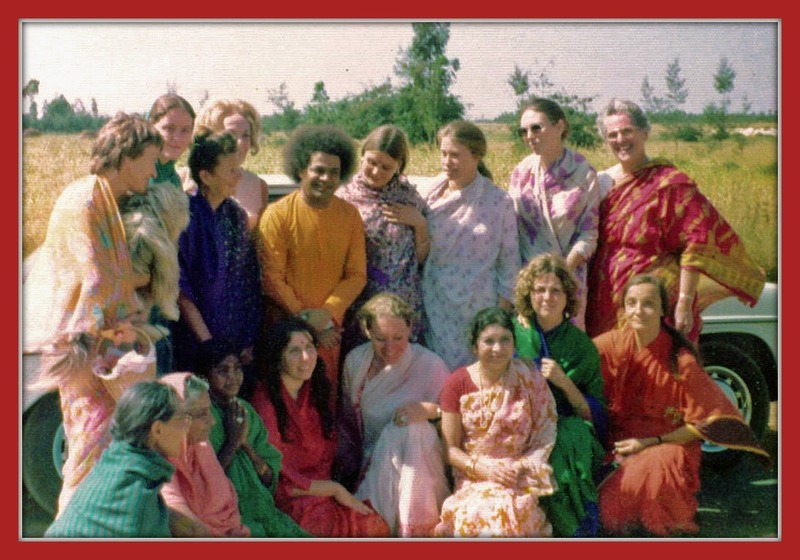 When Diana Baskin, a longtime devotee from USA visited Him in 2010, Swami told her the day she was leaving, “I AM NOT GOING ANYWHERE” He repeated this to her twice from the car and she did not know then what He meant. The relevance of His words flashed on her when she was grieving for Swami a year later. The Guru’s mission appears to be two-fold. The first and most important concern of the Guru is to awaken, elevate and transform the seeker. The second and final purpose of the Guru is paradoxically to help the disciple seeker to transcend this state of complete dependence on the Master, which dependence the Guru himself had taken such pains to foster. The final spurt of realizing his true identity with God is exclusively the Seeker’s job. “Today (28 July 1999) is Guru Purnima. What its significance? “The Gita declares,’ Eeshwara dwells, 0 Arjuna, in the heart region of all beings (Eeshwaras-sarva-bhootaanaam Hrid-deshe Aq’uana Tishthati). Eeshwara therefore means the Lord of the heart. He illumines the heart of every being. This means the Divine Power of Eeshwara is present in every heart. The other name given to Eeshwara is the Lord of the Heart, Atma. It is from the heart that the mind has emerged. The mind corresponds to the Vishnu Principle. Vishnu means all-pervasive. The mind is equally all-pervasive. ‘Mano-moolam Idam Jagat’ (The mind is the basis of the cosmos). The mind pervades the entire universe. Hence, it signifies the Vishnu Principle. Brahma is traditionally described as arising from the navel of Vishnu. It is from the mind the speech has come. ‘Vaak’ is the embodiment of Brahma. Hence, Brahma has, among other names ‘Shabda Brahmamayee’ sound (Shabda) as Brahma. “Three colours have been ascribed to the three Gunas. It is commonly believed that Vishnu represents the Satva Guna. It is not so. The Satva Guna is really the attribute of Eeshwara (Shiva). It is not subject to Maya (delusion). In the state of Yogic sleep (Yoga Nidra), it acquires the Chit- Shakti (the power of awareness) and appears as Shuddha Atma (the Pure Absolute). Hence, Satva represents Eeshwara Principle. Its colour is white. Rajo-guna manifests itself in likes and dislike. But this is wrong. It is a quality associated with Vishnu. Vishnu has been depicted as a deity bearing the conch, the discus, mace and lotus. Vishnu has also been described as “Alankaara-swarupa’ (one who is embellished by decorations). Vishnu also bears the name ‘Vishwambhara’ (one who protects and rules over the universe). As a ruler, he has the Rajo-guna. The colour of the Rajo-guna is red. Then there is Brahma. The Rajo-guna has been attributed to Brahma. This is incorrect. Brahma represents Tamo-guna. Tamo-guna is associated with (Andhakaara). It is filled with ‘Mamakaara’ (the sense of possessiveness, attachment, ego) and ‘Abhimaana’ (pride). These two impulses account for creation. If there were no sense of ‘I’ and ‘Mine’, the creative process would not go on. These two are the insignia of Tamo-guna, represented by the black colour. 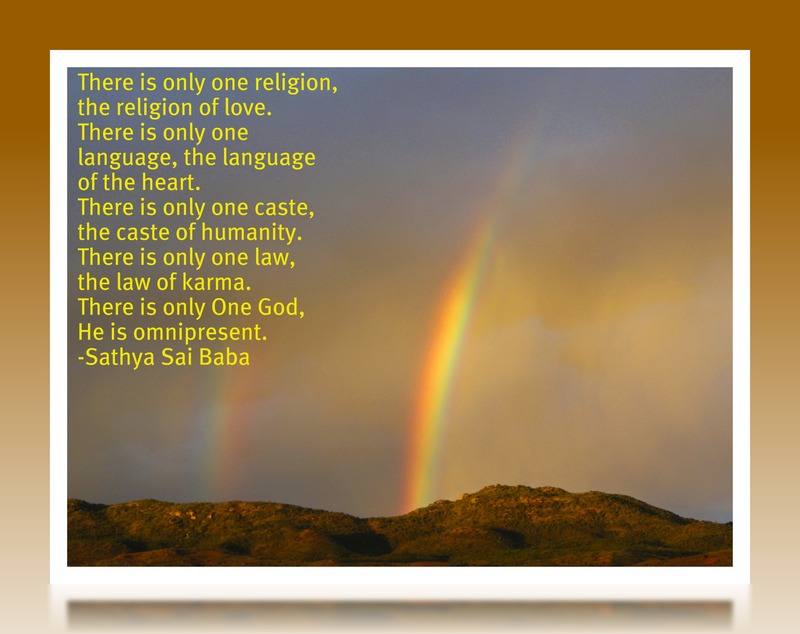 Beloved Baba, we remember your words on this your day. 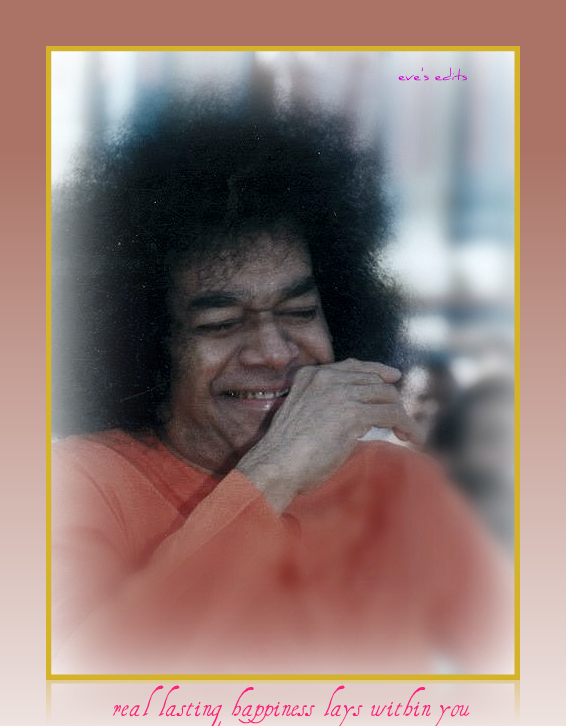 Note to readers: all SathyaSai Photos that have been edited by me, will be in future, watermarked. thank you.